Primephonic overhaul includes offline listening update | What Hi-Fi? 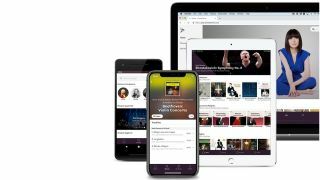 Primephonic, the Dutch-American music streaming service specialising in the classical genre, has overhauled its app and desktop platforms via a new software update. The update – available now in the UK, with a global rollout expected in May – will allow users to download personalised and pre-made playlists for offline listening when there isn’t mobile data or wi-fi connection handy. Later this month, that offline functionality will extend to full albums too. Since its inception in 2017, Primephonic has grown to over 1.5 million classical music tracks in its catalogue, with albums available to stream in their highest quality – including in 24-bit. Its interface and user experience has undergone improvements since our 2017 review, too, which was largely unfavourable due to flawed functionality. For one, a built-from-the-ground-up ‘smart search’ tool has been designed to make it easy to find works based on, for example, name, composer, opus number and choir etc, with classical music experts manually inputting data to the tool to ensure accurate results. The upshot of such improvements? A much-improved service, as we stated in our very recent four-star review. "Our mood toward Primephonic has taken an about turn. From being a bright concept woefully executed, it is now a service we could recommend as a go-to for existing classical music fans and those wanting to expand their sonic horizons alike," we said.